By admin , in Polymyalgia Rheumatica on April 15, 2019 . When an older person develops severe aching of the muscles, it may be polymyalgia rheumatica. This is a fairly common kind of rheumatism. It is a serious condition but the treatment for it is extremely effective. Hence, it is important to know a little bit about it. Let’s take a look at those long words. The prefix poly means “many.” The root my in the middle of the word means “muscle.” The ending algia denotes “pain.” So the first long word means “pain in many muscles.” The second word, rheumatica, just tells us redundantly that the aching and pain are those we often associate with the rather vague term rheumatism. This syndrome was recognized in the United States in the late 1960s. The cause is unknown, but the pain and disability seem related to inflammation of the small blood vessels that supply the muscles. So it is probably an arteritis —that is, an arterial inflammation—rather than a muscle disease. But it is listed here because the muscle aching is the major feature. It is not related to polymyositis, discussed next, which involves inflammation of the muscle itself. Because the condition is so serious and the treatment so effective, early detection, diagnosis, and treatment are important. The disease is by no means rare. One in every several hundred people will experience it. Polymyalgia rheumatica causes muscle aching in persons over the age of 50. It involves principally the muscles of the neck and shoulder regions, frequently with pain and aching in the hip areas also. The average age of patients is close to 70. The onset may be gradual or may occur over just a few days. Morning stiffness can be pronounced in some patients. If not diagnosed and treated early the condition may get worse, and may even resemble cancer. Patients may be tired, have low fevers for a long time, and lose significant amounts of weight, even as much as 30 or 40 pounds (14 to 18 kg). There can be a synovitis in some patients, so the joints as well as the muscles ache. The artery inflammation found in some patients may affect the arteries of the temples. There may be pain or visible redness over these arteries, and they may hurt when pressed. Using the affected muscles, as in using the arm repeatedly or in chewing a thick steak, may cause pain due to inadequacy of blood supply. In rare cases the artery to the eye can be affected, causing blindness in the eye. This is the most serious complication of the disease. When artery inflammation is found this disease is potentially more severe and is called giant-cell arteritis. In the laboratory, the sedimentation rate is greatly elevated. Indeed, this test is higher in polymyalgia rheumatica than in any other disease. Additionally the level of fibrinogen, a soluble protein in the blood, may be raised, and the patient is often anemic, sometimes severely. Biopsies of the arteries are sometimes helpful for diagnosis, but biopsy of the muscle shows surprisingly little damage under the microscope. A biopsy of the temporal artery can sometimes prove the diagnosis of giant-cell arteritis. There are no X-ray changes characteristic of polymyalgia rheumatica. Without treatment this condition appears to last three to five years on the average, gradually disappearing thereafter. During that period all patients will have been symptomatic and a few will have lost vision in one or both eyes. With treatment, on the other hand, the patient is immediately nearly well, typically within two davs of beginning treatment. Blindness after treatment is exceedingly rare, and complications from treatment are relatively unusual. Polymyalgia can be very similar to rheumatoid arthritis that starts in the later vears. Some patients will be found after several months or years to have actually had rheumatoid arthritis. The cornerstone of treatment is corticosteroid medication. The drug usually chosen is prednisone , and it is started at a medium or high dosage depending on the severity of the case. It is then rapidly decreased to lower doses, which must be maintained for some time. Prednisone is typically required for eighteen months to three years, occasionally longer. The prednisone does not cure the disease but is successful in entirely eliminating the symptoms. Usually the increase in activity afforded by the prednisone is so substantial that it makes up for any side effects that might occur. There does seem to be a slight tendency for patients on prednisone to develop the shingles. Some patients may suffer some osteoporosis or softening of the bones and mav have fractures, particularly of the spine. The response to treatment is absolutely dramatic. 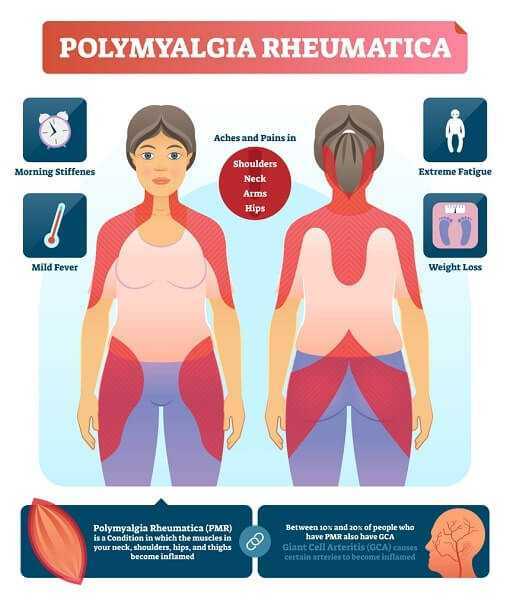 Polymyalgia rheumatica frequently affects individuals who have been active throughout their lives, leaving them ven disturbed bv their inability to engage in their favorite activities. A patient who loves to play golf, for example, and has been unable to play for the past six months because of pain in the shoulders and neck is likely to become depressed and discouraged. Usually patients will suggest that it must be “old age” catching up with them.